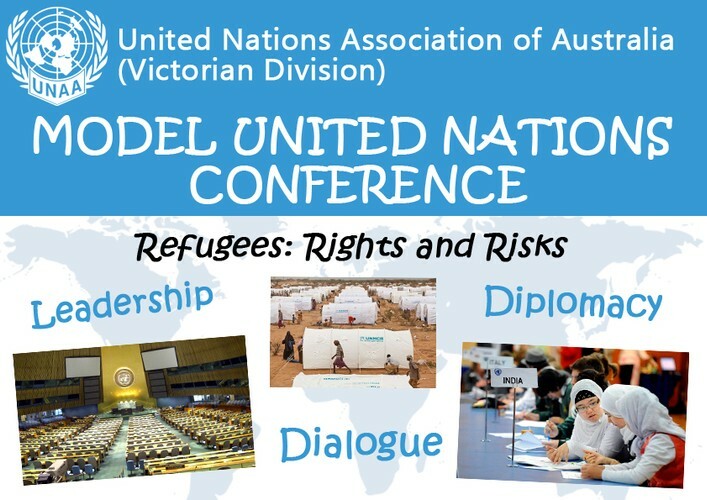 Organised as part of this year's National Youth Week, the UNAA Model United Nations Conference will bring together young people from diverse backgrounds to debate and discuss the topic of Refugees: Rights and Risks, in a spirit of dialogue, negotiation and intercultural understanding. This Conference is organised in partnership with the Goulburn-Murray Local Learning and Employment Network, Victorian Arabic Social Services, Sudanese Australian Integrated Learning, City of Greater Dandenong Youth Stop and Yarra Ranges Council Youth Services, thanks to funding from the Victorian Multicultural Commission. This conference will be chaired by acting UN Secretary General Ian Howie, Adjunct Professor, International Studies, RMIT University, with guest speaker Pamela Curr, Campaign Coordinator, Asylum Seeker Resource Centre. Dan Ryan, UN Youth Representative for Australia, will also come to share his experience. A Model UN Conference simulate a session of the UN General Assembly through a creative forum of role play and debate. Participants step into the shoes of country ambassadors and draw on negotiation and diplomacy skills to ensure their views are heard. Throughout the conference day they have the opportunity to interact with other ambassadors during the caucus sessions, present their country’s position to the Assembly and move amendments to the Resolution and its specific recommendations. The objective of a Model UN Conference is to find the best possible solution to the problem at hand through multilateral diplomacy. A successful MUNC is achieved when delegates can reach a compromise based upon their own country's national interests, international responsibilities and humanitarian obligations. The outcome is formalised in the adoption of a sound resolution. By taking part in a Model UN Conference, participants not only learn about UN bodies and member states, but also about the importance of dialogue, diplomacy, negotiation, and building consensus. These skills are fundamental to the development of global citizens and future leaders.